Full disclosure: I was checked out for most of the regular season in college basketball. Scoring was down, the fouls and timeouts ruined the flow of every game, nobody could make a jump shot — all the usual complaints that NBA snobs make. This year I became one of those snobs. But that’s all over now. The tournament has been so, so good. Even better than it usually is. We had upsets early on, but the best teams survived, and now it’s all perfect. The Sweet 16 is loaded. We have Kentucky, the best juggernaut you could ever ask for, and then four or five other teams who could at least give them a real scare down the line. Games have gotten better every round. For the first time all year, I’m planning my schedule around college basketball. With that in mind, here is an emergency viewing guide for this weekend. Death, taxes, and Izzo in March! There are lots of traditions in sports that deserve the most exaggerated eye roll on earth — amateurism in the NCAA, or the entire sport of baseball, for example — but there are a few tired, beaten institutions I will love forever. Stupid things, like how the Raiders will always be a toxic wasteland of a football team, or how Bill Belichick will always dress like a homeless person. Or how Charles Barkley will completely ignore highlights to screw with Kenny Smith, and Ernie Johnson will always pretend like he’s fed up even though he clearly loves it. No matter how crazy sports get, certain landmarks keep us sane. Tom Izzo in March is one of those stupid things for me. Every year, Michigan State will go through an underwhelming season full of ugly nights in the Big Ten, will get a suspiciously lucky draw on Selection Sunday, and then the rest is like clockwork. It’s great. It feels more like March if Izzo is gutting out ugly tournament wins. So yeah, bring on the slugfest here. Branden Dawson is Draymond Green, Travis Trice is Kalin Lucas, and Denzel Valentine is Delvon Roe. Let’s do this. All I know about Oklahoma is that the entire team lives and dies on a gunner named Buddy Hield. You can never have too many star athletes named Buddy. And if the Sooners win Friday, that just means Buddy went nuts. There are no bad outcomes from this game. Look, not all of these games are great. I won’t lie. Montrezl Harrell is what a linebacker playing basketball would look like, but otherwise, I think I’m good here. 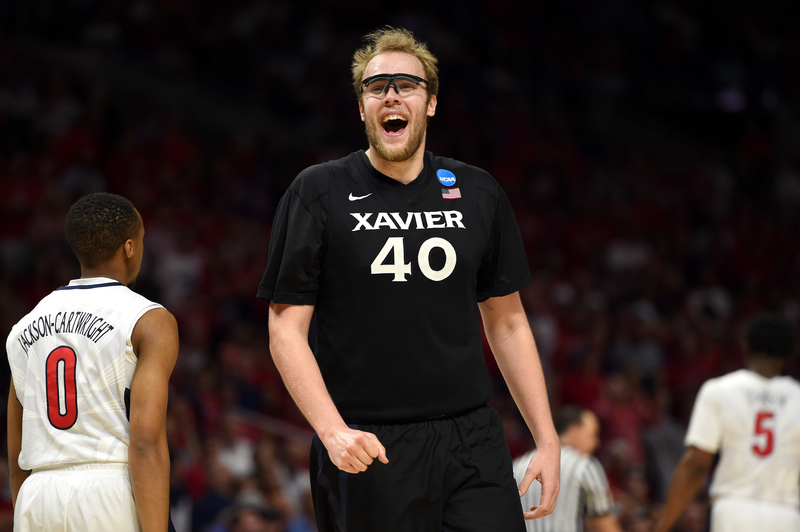 Instead of discussing this game, let’s talk Xavier’s Matt Stainbrook. He’s the closest we’ve come to College Basketball God since Eugene Edgerson. Last night was the only game I’ve ever seen him play, and he rocketed right into my top five favorite college basketball players ever. • His father is a software engineer at NASA. • He is a part-time Uber driver. • Xavier fans call him the STAIN TRAIN, and he endorses this nickname. • He is really good. For real. He’s the guy in the pickup game who looks like he has clubfoot and hasn’t worked out in years, and you’re worried he may not even make it through the whole thing. Then you start playing, and he just goes to WORK. Nifty little post moves, rebounds on which his feet never leave the floor, perfect passes to set up teammates … Knee pads and rec specs and backstory aside, he’s one of the best players in the country. • All of this is the greatest Kimmel prank ever. If you’re stuck watching NC State–Louisville … just watch this instead. UCLA tournament runs are the opposite of Michigan State’s. Maybe it’s because UCLA is located in paradise, instead of East Lansing. It feels like this program has been doing this since I was in grade school. It always has these teams full of stars who are a complete mess, and then they sneak into the tournament and go on a run that’s impossible to cheer for, because they wouldn’t be underdogs if they hadn’t been such a disaster all year long. It’s fun for one year, but not 20. Get your act together, UCLA. Yes, Bryce Alford is like Marshall Henderson crossed with Aaron Craft — I love him for this — but if you cheer for UCLA to win here, you are part of the problem. Do not enable this basketball program any more than the selection committee already has. FYI if you don't follow CBB and fell in love w/ Stainbrook last night, watch Gonzaga tonight. Karnowski is basically Stainbrook w/o goggles. I’ve been ready for this game since Selection Sunday. Start with Delon Wright for Utah. He is a fearless, shoot-first senior guard from L.A. — brother of Dorrell Wright from the Blazers — who is everything I’ve ever wanted in a college basketball player. High volume, all heart. Next to him is a 5-foot-10 guard, Brandon Taylor. Taylor is also from L.A. and plays like the most enjoyable point guards ever. Then there is JAKOB POELTL, the 7-foot future lottery pick from Austria. He will give Jahlil Okafor the stiffest challenge Okafor has had all year. I’m not saying Utah will win. Duke has Justise Winslow and Okafor, both of whom are unfair weapons to unleash on college kids. Then there’s Tyus Jones, the freshman point guard who plays like a senior and comes up with big shots pretty much every game for Duke. Those three alone make it crazy to bet against Duke here, or against anyone outside of Kentucky. But Utah will make this fun. Watch. I swear. THE SEQUEL. PART DEUX. 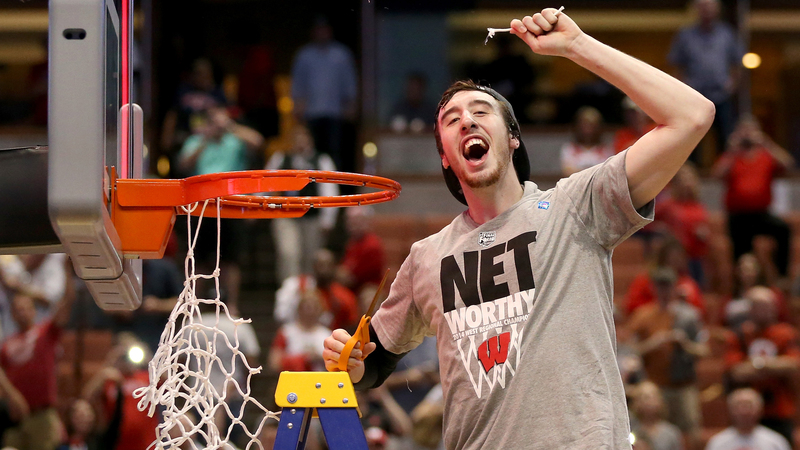 2 FRANK 2 KAMINSKY. Let’s be honest, though: This game was awful last year. It took place at the regional final, when two great teams collided to produce one of the most unwatchable close games all season. The thinking here is that last year’s clash was so brutal, this year can’t help but go the other way. If that happens … these are two of the three best teams left in the tournament. 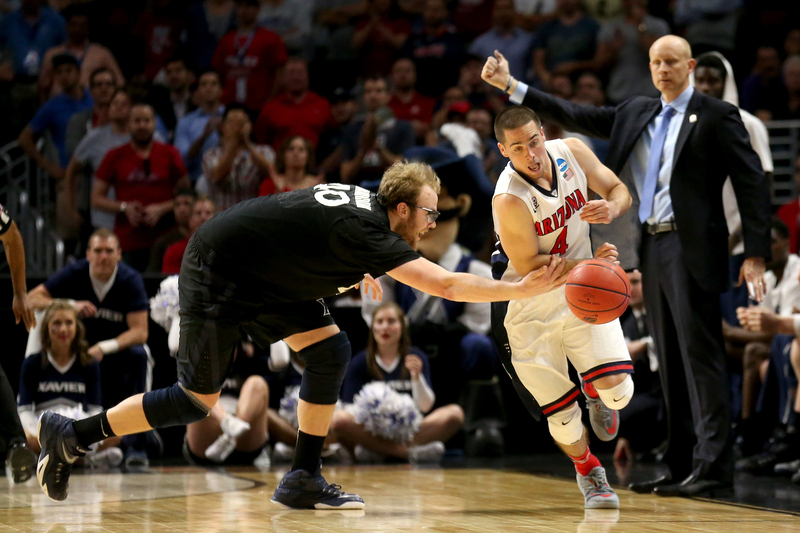 Guys like Gabe York and T.J. McConnell are perfect role players to go with Arizona stars like Stanley Johnson and Brandon Ashley. Bo Ryan’s Wisconsin teams squeeze the life out of games as a rule, but for the past two years, Sam Dekker and Kaminsky have given the Badgers enough offensive firepower to beat anyone. These are probably the two teams left in the tournament with the best chance to throw Kentucky off its game and ruin a perfect season. Make room for this game on Saturday. Last year was so bad, this has got to be great. That was like watching the Book of Revelation on a basketball court. Kentucky players were dunking on each other, 3s were coming from everywhere, and if West Virginia were a country, last night’s shooting percentage would have qualified it for foreign aid. 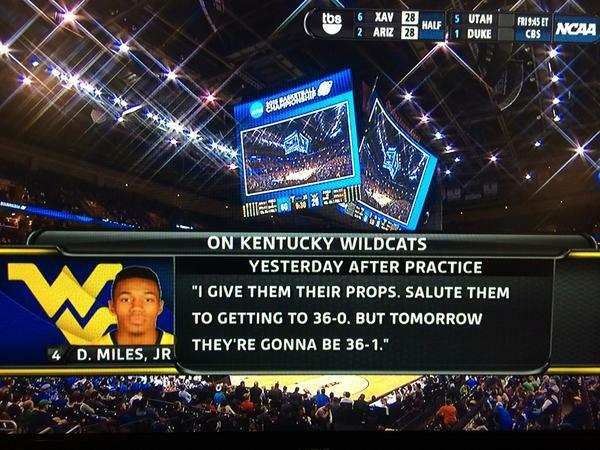 Do not talk trash to Kentucky. Ulis: "They should've just kept their mouth shut and it probably wouldn't have been like that." On the other hand: If this were a sports movie, that game is exactly what happens before a team full of lovable, 3-point shooting underdogs takes Kentucky down. Arizona and Duke may theoretically match up with Kentucky better, but if the Wildcats lose, it won’t be because a team beat them at their own game. It will be a freak accident. Like, say, Jerian Grant and Pat Connaughton channeling the Holy Spirit for 40 minutes and draining so many 3s that Kentucky starts playing tight, the game gets way closer than it should, and it all comes down to one final shot. That’s when Connaughton, from Arlington, Massachusetts, steps out there, stares down Karl Towns and Willie Cauley-Stein, and hits a game winner in their faces. Cue music, cue still-photo montage of the celebration and a “Where are they now?” update, cut to credits. Will any of this actually happen? But that’s what’s great about Kentucky games. Even when this team destroys your fairy tales, it’s so entertaining that it’s worth watching anyway. If it’s Duke-Gonzaga, it will likely be the best game of the tournament. If it’s Utah-Gonzaga, we can all cheer for Delon Wright and POELTL to shock the world. 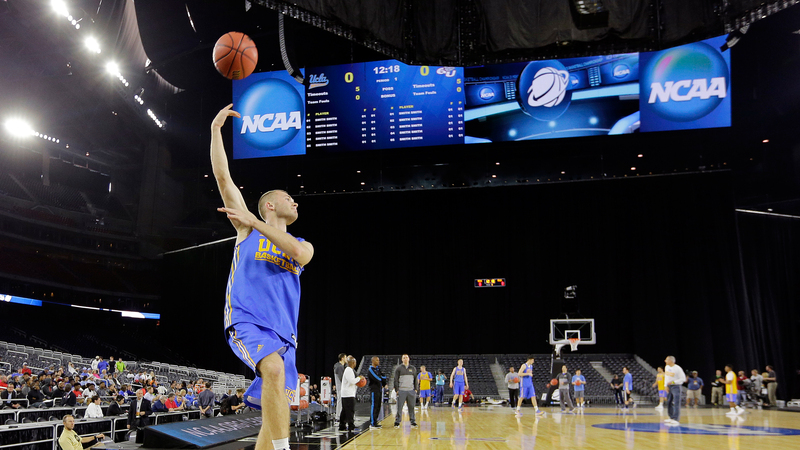 If it’s UCLA-Duke … well, that gives us a great chance of a world-ending Kentucky-Duke final. No bad outcomes. This is the best tournament we’ve had in years. For real. This is the glitch in the matrix. The tournament is great right now, but with all due respect to Tom Izzo, we need to start a national petition to disqualify the East bracket from the Final Four. Send Xavier instead. Seriously. Xavier is better than every team in the East. If you’re watching this game, do not watch this game. Spend the entire time dreaming of what would happen if Matt Stainbrook were to take down Kentucky in the NCAA final. Would we even need sports after that? Obama would declare the following 365 days national holidays. The 2015 One Shining Moment would be the first YouTube video ever entered into the Congressional Record. There would a five-part 30 for 30, and “stainbrook” would become like an English-language version of schadenfreude, except the feeling would be some combination of patriotism, euphoria, and disbelief. Forget the East Regional final. We need Xavier in the Final Four. Rating: Write your local congressperson.